Did you know YouTube is the SECOND largest search engine? 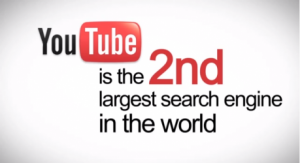 This makes sense because YouTube is owned by Google, but WOW! Posting videos is becoming more popular and people LOVE to watch videos and video marketing instead of reading pages of text. It is crucial for your business to create a YouTube channel and post videos regularly. You can post the TV commercials you use or make videos special for YouTube. So, I’m sure you are wondering what type of videos you need to create. FLIP will help you brainstorm some ideas to help your customers really connect with your business and make you a trusted source in your industry! Customers will feel like they have met you before actually having a face to face meeting, which will help them feel more comfortable and trusting. There are several different ways to do YouTube video marketing. Many people use their webcam or a friend’s video camera and just start talking. Is this ok? It really depends on your business. Again, think about your customer – what are they expecting from you? What type of material are you putting into your YouTube video marketing? We had an attorney who was afraid his clients felt he was not personable enough so he set up a webcam in his office and just talked about his practice and legal matters casually. On the contrary, another attorney felt his clients would expect nothing less then professional quality YouTube videos so we had a production crew come to his office and create all the videos. You can choose one method or a combination of both, just as long as you have YouTube content. Google LOVES videos as much as people do, so many times YouTube videos get ranked organically on Google too! There are ways to optimize your videos and your YouTube channel to make sure your videos get more Play then others. The more times your company shows up on the Google organically, the more chances you have for clicks! FLIP will help you with all your YouTube Video Marketing!